Regal Development Solutions, in association with Kev In Art, is pleased to introduce a new attraction called Paradise Sip and Paint, a unique and exciting option for visitors to the island and locals alike. Every 2nd and 4th Sunday of each month, be there to make memories, new friends and take your masterpiece home with you after. NO painting experience necessary. Includes refreshments, wine, all art supplies, entertainment and transportation to and from the venue for visitors. 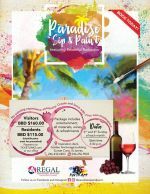 Tickets available via www.ticketlinkz.com or from the Regal office in Sunset Crest.